Who hasn't fantasized about being the one who hits the game-winning homer? Who hasn't dreamed of being the homecoming queen? And how many times have we dreamed of being rich, or successful, or happy with our relationships? Related : Who are the underminers? On the other hand, if you told someone a hundred years ago that it was possible for man to be on the moon, they would laugh at you. If you had told them that you could send mail from here to the other side of the world in a few seconds, they would say you were out of your mind. Think big and work hard to attain those dreams. As you step up the ladder of progress, you will just about find out that the impossible has just become a little bit more possible. 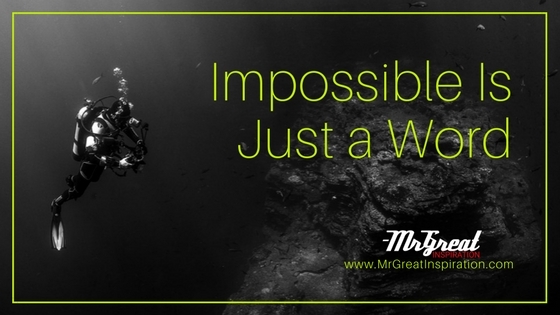 We hope guys you find our article "Impossible is Just a Word" by Mr Great Inspiration useful.